Completion of SSTmoderate within the past two years is required for access to SSTdeep program. Please note, ASA recommends the completion of the full Safe Sedation Training – Deep program for the most comprehensive training for those administering deep sedation. Modules were developed based on ASA guidelines for non-anesthesiologist physicians seeking privileges for deep sedation, to ensure the highest standards in patient safety. Patient safety is of the utmost importance when administering sedation. 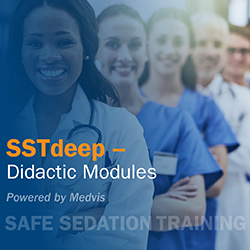 Safe Sedation Training – Deep (SSTdeep) – Didactic Modules were developed based on ASA guidelines for non-anesthesiologist physicians seeking privileges for deep sedation, to ensure the highest standards in patient safety. Contact Nate Wicks, Senior Sales and Group Relations Manager at (847) 268-9214 or n.wicks@asahq.org for more information. For product or post-purchase group enrollment (>1 licenses) information contact, Matthew McNutt, Simulation Education and MOCA Coordinator, at (847) 268-9271 or m.mcnutt@asahq.org.